For my first substantive post I would like to discuss a topic that raises ire in many, not least of whom, my fellow urban dwellers. 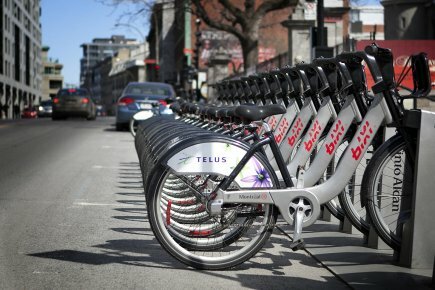 I consider the issue to be particularly timely with respect to the soon-to-be unveiled inaugural season of New York City’s own bike-share as well as the start of the third season for which I have subscribed to Montréal’s bike-share, BIXI. In my view, the public bike-share fills a critical niche in urban transportation. Complaints though are indeed numerous, and I will attempt to address them all here while providing my own rebuttals. What is a public bike-share? The latest generation of public bike-shares began with Lyon’s Vélo’v system in 2005, soon followed by Paris’ system called Vélib’ in 2007. They were the first to incorporate modern technology such as electronic locks, smart cards, telecommunication systems, and on-board computers. These systems allowed electronic payment to be made and for docking mechanisms to secure the bicycles in place. Bike-share systems usually allow for day rentals as well as monthly or yearly subscriptions. Usually, the first 30 to 45 minutes are included in the initial fee with additional time adding cost in cumulative intervals. After docking a bike there is normally a 2-5 minute waiting period before you can take another out, so if you are planning a longer trip it may be worth it to just park it and wait a few minutes. Stations are usually spaced within about 250 meters of one another and therefore work best in areas that can be supported by a high population density. The stations are typically modular, allowing many possible configurations to be added and changed and are usually energized by solar power, thus liberating them from fixed power sources. Why not just use a private bicycle? Perhaps the first and most obvious question one would ask is what benefit does a public bike-share provide that private personal bicycle can not. The simplest comparison to make would be that of a taxi to a private automobile. In fact, the name BIXI comes from the combination of bicyclette and taxi, and upon further inspection, the similarities become clear. As far as private automobiles go, once you have purchased one you are responsible for its upkeep, parking, and any other associated expenses. Of course the advantage is that it belongs to you and you can drive it to and from just about anywhere your heart desires. Conversely, when you leave a taxi, you are no longer under any obligation for its well-being; you do not have to worry if it gets damaged or stolen. The downside is that the area in which you can find one and take one to is considerably more limited than that of your own car. Clearly each situation presents its own merits and constraints and the mode you choose is subject to your own specific circumstances.